Your greeting team is one of the most influential parts of church growth. These are the first people that your guests will get to interact with. Some guests will even base their overall experience off the first impression of your church. 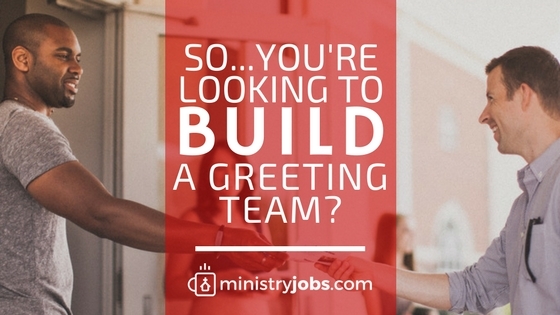 Growing up in the church, the greeting team or guest experience team was never something that our church did. It wasn’t that we didn’t want to do it, we just didn’t know where to start or how to get people on board with the idea. Here are a couple things to think about when starting your greeting team! What will you call this ministry? There are many of great names out there like greeting team, guest experience, first impressions, and hospitality team. There is no right or wrong answer, choose one and let your church know! Who will lead this ministry? Is this a paid position, or is this a volunteer spot? Sometimes the best answer as to who should lead this ministry is the one person who is asking for it! How will you get people to join, and who should join? Asking people to join is one of the easiest and most effective ways when building a team. A simple email, sign-up sheet, or face to face invite are just a few ways you can gather a team. It’s always a good idea to find people that are outgoing. Greeting complete strangers is very intimidating, especially for the introvert. Do you have team expectations? Most people enjoy getting involved, but sometimes we forget to explain to them what they will be doing and what is expected of them. We can communicate this through team training. Finding a night that works best for all team members is ideal. There you can share the vision and ideas they will need when greeting someone for the first time! What are a few items needed to get started? Find the funds to purchase nametags for all your greeters. Nametags are a great way to personalize your greeters and the team. Church should be the most fun, joy-filled place on earth! Don’t forget to smile. Derek is the Marketing Director at Froot Group, a worship staffing company.